In his three seasons, old ninety-eight scored 33 touchdowns, kicked two field goals and kicked 33 points after touchdowns for 237 points, and threw 16 touchdown passes. He gained 3,438 yards rushing and passing, and played almost every minute of his three-year career. A solid 193 pounds, Harmon was a power runner noted for his cutbacks through tackles-usually with his ripped jersey. He was probably the finest ball carrier in the country in his time. Against Ohio State in his final college football game, Harmon went 11 for 12 throwing the ball for 151 yards and 2 TDs. He also ran for 139 yards and 2 TDs, kicked four extra points and intercepted three passes as the Wolverines trounced Ohio State 40-0. He also averaged 50 yards per punt. 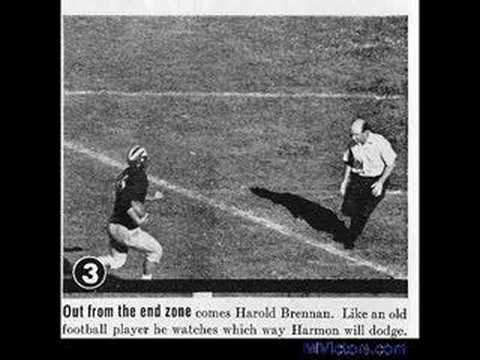 Harmon's subsequent career in broadcasting is even more outstanding than his football accomplishments. After a four-year stint as a pilot during World War II (he won a Silver Star and the Purple Heart), he married actress Elyse Knox and played for the Los Angeles Rams in 1946 and 1947. In 1949, after experiences as Sports Director of WJR in Detroit and commentator on KIEV in Glendale, he became Sports Director of the Columbia Pacific Network with daily radio and television shows. Tom reported "live" on major sporting events from the Olympics to the Rose Bowl for networks such as CBS, ABC and NBC, eventually totaling over 10,000 broadcasts. Tom broadcasted for the Los Angeles Raiders until he passed away in March of 1990. Tom Harmon won all areas but the Southwest, which once again was taken by the hard-running "Jarring Jawn" Kimbrough of the Texas Aggies. Others in the voting included Charles O'Rourke of Boston College, Bob Suffridge of Tennessee and Norm Standlee of Stanford. 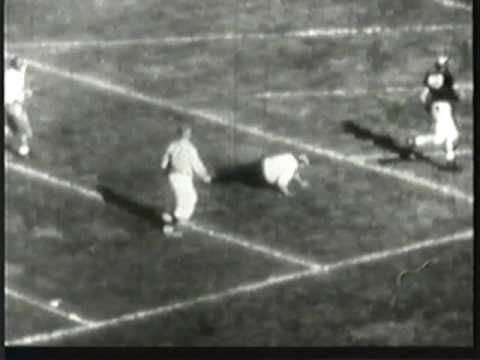 Thomas Dudley Harmon (September 28, 1919 – March 15, 1990) was a star player in United States college football, a sports broadcaster, and patriarch of a family of American actors. As a player, he won the Heisman Trophy and is considered by some to be the greatest football player in Michigan Wolverines history. 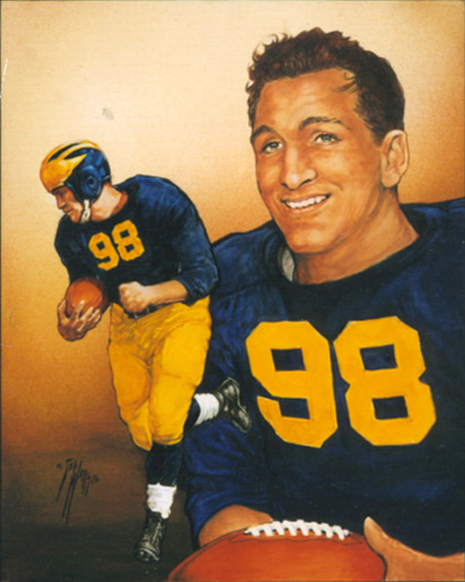 Harmon played college football at the University of Michigan from 1938-1940, he majored in English and Speech, hoping for a future career in broadcasting, and won the Heisman Trophy his senior season. Although he made his name as a running back, he also excelled as a kicker and quarterback. Harmon rushed for 2,134 yards during his career at Michigan, completed 100 passes for 1,304 yards and 16 touchdowns, and scored 237 points. During his career he played all 60 minutes 8 times. He also was a member of the varsity basketball team for two years. 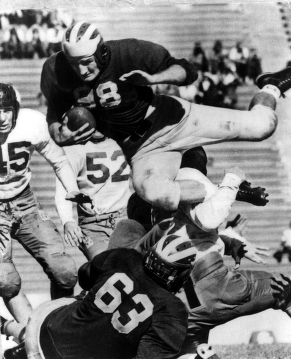 In his final football game, against Ohio State Harmon led the Wolverines to a 40-0 victory, scoring three rushing touchdowns, two passing touchdowns, four extra points, intercepting three passes, and punting three times for an average of 50 yards. In an unprecedented display of sportsmanship and appreciation, the Ohio State fans in Columbus gave Harmon a standing ovation at game's end. No Wolverine player has been so honored since. 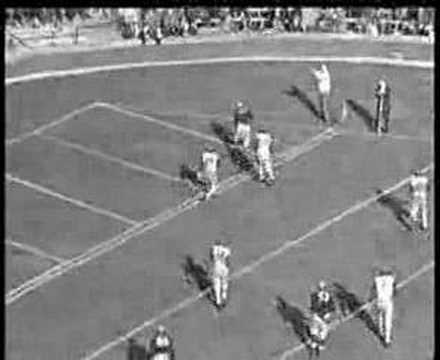 He led the nation in scoring in 1939 and 1940 (a feat that remains unmatched), and was elected to the College Football All-America Team both years. In 1940, he won the Heisman Trophy and the Maxwell Award both given to the outstanding college football player of the year. While on campus, he was an active member of the Michigan Alpha Chapter of the Phi Delta Theta fraternity. Years later, the national fraternity leadership established the Harmon-Rice Award in his honor (the Rice name in the award honored Grantland Rice) that is presented each year to the most outstanding Phi Delt collegiate athlete in the nation. In 2007, Harmon was ranked #16 on ESPN's Top 25 Players In College Football History list.